The Australian Light Horse Studies Centre aims to present an accurate history as chroniclers of early Australian military developments from 1899 to 1920. The Australian Light Horse Studies Centre site holds over 12,000 entries and is growing daily. WARNING: This site contains: names, information and images of deceased people; and, language which may be considered inappropriate today. The Australian Light Horse Studies Centre in conjunction with the various Education authorities in Australia, has embarked upon producing a program of instruction targeted initially towards the Later Adolescence band of scholars, characteristically those who are studying in Year 9 and 10 within Australia. Each lesson will be a self contained module. Some will be more difficult than others and graded accordingly. 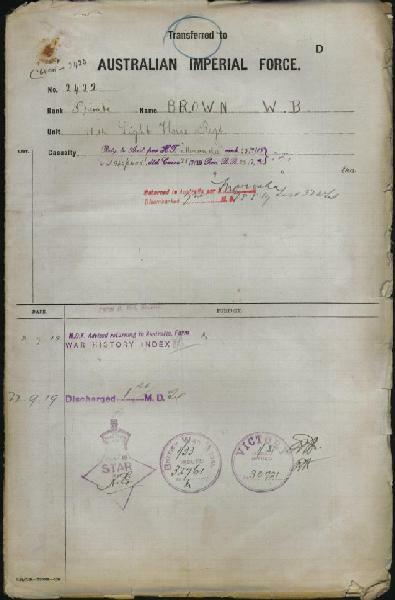 2422 Pte William Bert Brown, Attestation Paper, p. 1. This information is vital as it identifies the specific soldier and in case of death or injury, allows the relatives to be informed. The next of kin was important for another reason. Each soldier was compelled to give an allotment of their daily wage to the person nominated as the next of kin. This was an essential financial consideration. Once this information was gathered, the second page dealt with an oath to the King. The next page to give information was page 3. 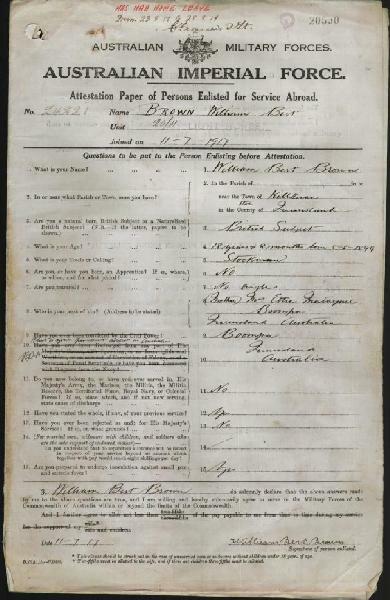 2422 Pte William Bert Brown, Attestation Paper, p. 3. The health of the potential soldier was important as the life was particularly strenuous. The ability to carry heavy weights for great distances was most important. The next form that is most common in the Service File is the B103, the Casualty Form - Active Service. Every movement of the soldier is recorded. The reasons for this are fourfold. 1. The location of the soldier at any one time was essential to establish where his rations were to be drawn. 2. The form established the entitlements to drawing pay at a particular level. A soldier in the field was allowed to draw pay but when in hospital was not allowed to draw their pay as it was considered that everything to assist the soldier's recovery was provided. 3. By tracking the movements of the soldier, it allowed early detection of desertion if that were to occur. 4. 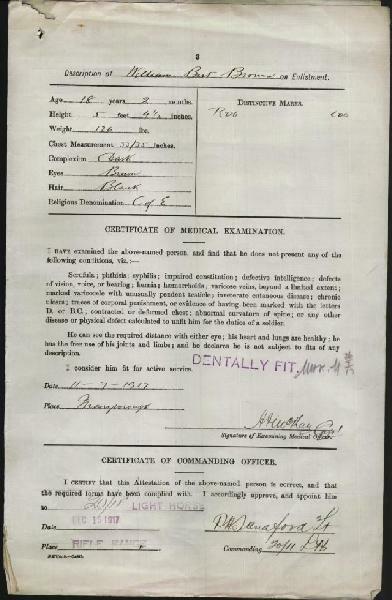 At the end of the war, the chronology of this form was used as the basis for post war entitlements such as medals, pensions, repatriation assistance, access to hospitals and any other service available for an ex-serviceman for the rest of his life. The B103 may be as simple as one sheet or multiple sheets. It depended upon the individual serviceman. 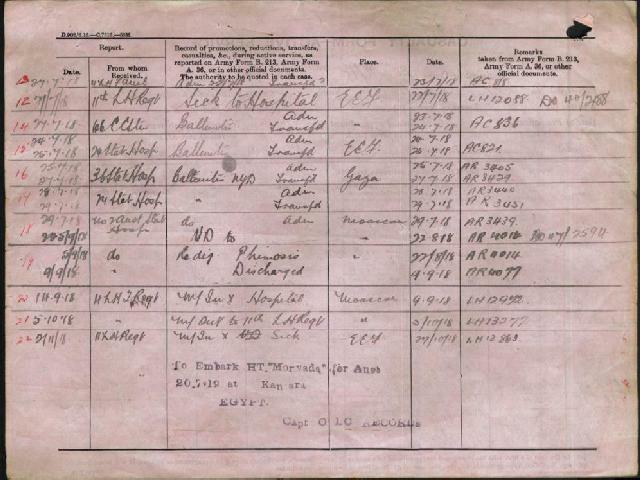 To assist in understanding this particular form in relation to the men from the 11th LHR, Lesson 11 Resource, a list of terms and names are available at the Index to Common B103 Terms. The link is below. 2422 Pte William Bert Brown, B103, p. 1. 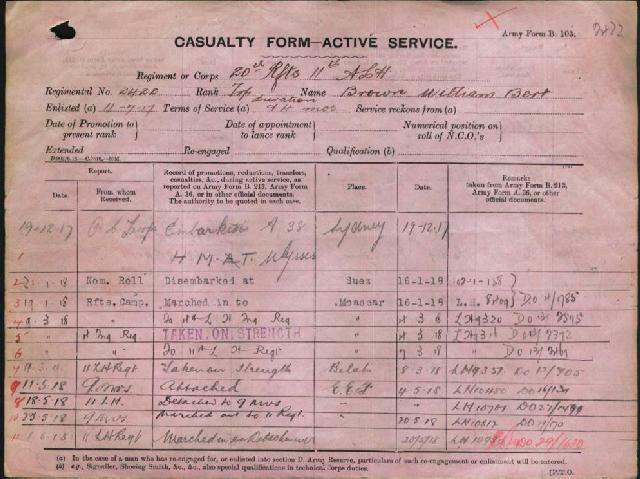 As can be seen, the form is a chronology of the man's service in the AIF. All B103 forms in every service file is similar. In this case the man has two pages to the form. To finish his story, the page will be turned over. 2422 Pte William Bert Brown, B103, p. 2. Once the B103, the Casualty Form - Active Service was completed due to the expiration of service, any transactions during subsequent to service were recorded on a flimsey called Transferred to Australian Imperial Force D and it was here that all post service information was maintained. 2422 Pte William Bert Brown, AIF D, p. 1. The eligible medals awarded to the serviceman. Information on this form depends upon the individual. This particular form can at times run into many pages. ADFA Summary - This is a cameo summary of his service record. The Australian War Memorial carries two biographical data bases - the Embarkation Roll and the Nominal Roll which was closed in August 1919. Let us hear your story: You can tell your story, make a comment or ask for help on our forum. The Australian Light Horse Studies Centre is a not for profit and non profit group whose sole aim is to write the early history of the Australian Light Horse from 1900 - 1920. It is privately funded and the information is provided by the individuals within the group and while permission for the use of the material has been given for this site for these items by various donors, the residual and actual copyright for these items, should there be any, resides exclusively with the donors. The information on this site is freely available for private research use only and if used as such, should be appropriately acknowledged. To assist in this process, each item has a citation attached at the bottom for referencing purposes. Please Note: No express or implied permission is given for commercial use of the information contained within this site. The Australian Light Horse Studies Centre has made every endeavour to contact copyright holders of material digitised for this blog and website and where appropriate, permission is still being sought for these items. Where replies were not received, or where the copyright owner has not been able to be traced, or where the permission is still being sought, the Australian Light Horse Studies Centre has decided, in good faith, to proceed with digitisation and publication. Australian Light Horse Studies Centre would be happy to hear from copyright owners at any time to discuss usage of this item.